Just a general rule if anyone you don't know wants you to send money via Western Union its probably a scam. Two Things to Look for In a Long Term Care insurance provider. Long Term Care (LTC) insurance can be a good idea for someone in their 50s or 60's. This kind of insurance is not as common and may be a little harder to shop for than something like auto or home insurance. LTC is also an evolving product that insurance companies are still working to figure out how to handle well. Here are a couple things I'd recommend looking for when shopping for LTC coverage. This is not a good trend for the smaller, specialty LTC insurers. The rating of the company is a estimate of their financial strength. You really don't want to be buying insurance from a company that is on shaky financial footing. You can see the red line representing the small companies is steadily going down and is now in the C's which means they are 'marginal' or 'weak' financially. For this reason : I would avoid smaller insurance companies or those who specialize in LTC products only. Insurance companies are rated by A.M. Best, Moody's, Standard & Poors and Fitch. You should look for an insurer who has a high rating in the A's. A rating in the A's will be Excellent, Strong or Good level. The different rating agencies have different grading systems. AM Best explains the ratings here. The American Association for Long Term Care Insurance has a list of highly rated LTC providers. Looking at that list I might narrow it down to just the A+ companies. The B++ one is a few notches below the others in its rating. The A- Lifesecure is based on its parent company and I can't find out what that company is. From their website it seems Lifescure specializes in LTC too. The A rating for Genworth is OK. I might check them for a quote, but I'd try the A+ companies first. Ratings change over time so I would make sure to double check the current rating on any insurance company before I investigate the options. Of course there are other factors you need to look at when shopping for this kind of insurance. The coverage and price are major factors in the purchase decision. However sticking to larger diversified insurance companies with solid ratings will give you a safer product. I haven't been tracking or updating my Updown performance for a while. I looked back and realized my last update was in Sept. 2011. I haven't been actively trading in the account in that time either so what I've got there has ended up in a buy-and-hold strategy simply due to neglect. In total for the 6 months I'm up 9.4% and the S&P 500 gained 5.0%. A large portion of my holdings are in ABT, MSFT, T and WMT. Those 4 stocks are about 39% of my total. All four of them have had pretty good appreciation in the past 6 months. The remaining 61% of my portfolio was up only about 5.6% overall. So those 4 stocks had a big impact on my overall performance. The other stocks in my portfolio were up 10.7% overall. Overall the remaining 55% of my assets gained 7% in the 6 months. The rest of my stocks were up or down within 5-10%. Many of them were effectively flat in the 6 month period. Overall a few winners raised my performance ~4% and a few losers dropped it by ~1%. I don't own a truck. I don't need to haul stuff enough to warrant the purchase of a truck. Usually I beg a favor from a friend of mine when I need to haul something or I just rent a truck. I honestly prefer not to pester my friend cause I think it might be annoying for him to have to constantly haul stuff for people. If I do ask him then I always offer to buy him dinner or something like that to make it fair. The better option for me is to rent a truck. You can rent a truck at various places. I once rented a truck from Home Depot in order to haul a ladder home. That was pretty easy and didn't cost much. I've also rented a truck (actually a van) from Uhaul to haul some junk to the dump. I'm not thrilled with the experience with Uhaul in general but it got the job done. Some rental car companies also rent out trucks. Not all rental car agencies have trucks in their fleet but at least Enterprise does in my area. One more option for truck rental is Zipcar. They seem to now have trucks in their fleets. Sometimes I only need a truck for maybe an hour or less. That was the case when I hauled the ladder I bought at Home Depot. The Uhaul we needed for several hours so renting it for a day was the better option. I compared prices for the 4 different options for either 1 hour or 1 day rentals. *The pricing here may or may not include all charges like taxes or insurance. The Enterprise rental charge seemed to include everything but I'm not sure on the others. Zipcar prices for truck rentals actually vary from city to city but seem to be in the $10-14 range, but Ionly checked a few cities. Quickly looking at that table above it seems to me that Zipcar would be the cheapest way to go for 1 hour and Uhaul would be least expensive for a 1 day rental. However theres a couple things to consider. The Zipcar rental is only most practical if you're already a member and/or if you would rent a truck fairly frequently. They have a $60 annual membership fee that you'd have to take into account. So if you only rent a truck 1-2 times a year then Zipcar would not be very practical. For the Uhaul rental you'll notice they are the only one that has an extra charge per mile driven. The fairly steep 59¢ rate will add up quickly if your truck related errand requires much driving. If I drove to our rental on the other side of town that would be a 60 mile round trip and cost me an extra $35.40. Depending on what kind of trips you need to make with a rental truck any one of the four companies could potentially be the best choice. Of course the availability and rates vary from city to city so you'll want to check the details where you live. MMB also points to another deal for 100 Free American Airlines Miles which would also be a good way to reset your AA miles expiration date. Lastly MMB also shares Which Fuel-Efficient Cars Are Worth The Extra Money? ConsumerismCommentary wonders Should Rich Families Leave Their Wealth to Their Children? Over time generally you can expect costs to go up due to inflation. However, not all goods see increases in prices over time. Televisions for example keep dropping in price. Another example of lower prices can be found in apparel items. Clothing has dropped in price gradually over the past couple decades. The BLS Consumer Price Indexes tracks prices for many general product categories. 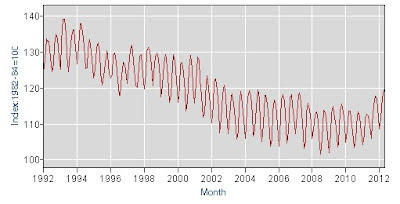 As you can see from this graph it gives a nice illustration of how the cost of womens apparel goes up and down regularly based on seasonal cycles. The prices for apparel go up in the fall and down in the winter then up in the spring then down in the summer. Up and down up and down over every year. This is a regular repeating pattern we see in the above chart. The BLS has observed this seasonal cycle and then figures how much the prices vary based on just the season of the year. Once the impact of the seasonal cycle is determined they can add or subtract that difference to obtain the seasonally adjusted prices. As you can see from both graphs, the prices for womens apparel has been on a downward trend for the past 20 years. From 1992 to 2011 the price index dropped from 129 to 109 or down about 15.5%. Just last year the prices started to go back up. From May '11 to May '12 the prices have gone up about 5.4%. That shows us that the deflation of apparel prices are a more recent trend. From 1978 to 1991 the prices were on a clear upward trend. Only around 1992 did the deflation start. They are free today and tomorrow (6/20 to 6/21). I don't know how good the books are but if you look at the Amazon listings you can check out the reader reviews there. I looked at a few of them and they all seemed to have 4+ stars. I noticed at least one book ( Gnome Wars ) isn't coming up as free on Amazon so make sure you pay attention and verify they're $0 before buying. If you don't own a Kindle then don't despair, can use one of Amazon's Free Reading Apps . I've discussed estate taxes before but I have really only been talking about the federal level. At the federal level only millionaires need to worry about estate taxes. But theres also state taxes to worry about and some states also have state level estate or inheritance taxes they impose which are separate from the federal estate tax. 28 states do not have estate or inheritance taxes. 22 states and D.C. impose some form of estate or inheritance tax. Each state that has these taxes has varying rules about exemptions and tax rates, so you have to look at the laws for the individual state to see if theres a liability. For most cases you do not hit estate taxes at the state level unless you have an estate worth more than $1 million in value, but there are exceptions. Inheritance taxes in Indiana can be levied for estates as little as $100 depending on the situation. I found a nice Survey of State Estate, Inheritance, and Gift Taxes written by the state of Minnesota. The document is from November 2011 so this information is dated but its always going to be a moving target with individual state occasionally making changes to laws. Here's a quick summary of which states levy estate, inheritance and/or gift taxes. If you buy a house with less than 20% down payment then you generally have to pay PMI or Private Mortgage Insurance. Simply put, PMI is extra insurance you have to pay to protect the bank from potential loses. I talked before about how much PMI costs and I briefly touched on how it how the true cost of PMI is often significant as a percent of the equity in question. I think its a pretty important point so I wanted to elaborate on it. If you're looking at paying $50 or $100 in PMI per month that may not seem like a huge amount. Its just one of the various things you pay to buy a house. You might have an $800 mortgage payment, $200 towards property tax, $50 for insurance and $50 for PMI. But the thing is that PMI is really only based on the short fall in equity so this $50 or $100 charge is kind of like paying extra interest on the extra money you borrowed. So if you go with a 10% downpayment instead of 20% on a $100,000 home then the difference is $10,000. The PMI charge is an extra cost for that $10,000 difference. $50 extra on a monthly payment for a $100,000 house doesn't seem as bad as $50 a month to borrow an extra $10,000. Consider an example : Lets say you want to buy a house for $200,000 and only have $25,000 to put down. Thats a large chunk of money but its only 12.5% rather than the 20% down you need to avoid PMI. For such a loan you would end up paying monthly PMI of about $90. That would cost you $1,080 over a year just for PMI. If however you had an extra $15,000 in the bank that you could put into the loan you'd avoid that $1,080 annual PMI cost. Effectively this means you're paying $1,080 yearly for that $15,000 difference. This equates to a 7.2% cost on that money for PMI alone. If you then add in the mortgage interest cost you're looking at another 4% for the mortgage you pay based on borrowing the extra $15,000. Between the mortgage interest of 4% and the PMI costs equating to 7.2% you're losing 11.2% on the short fall in your down payment. PMI is effectively costing you 11.2%. Thats a horrible rate. Worse yet, PMI doesn't go down as your equity increases. So the % amount you pay on your equity short fall only gets worse and worse. Lets say you get this loan with 12.5% down and keep making payments for a few years. 4-5 years from now you'll have made some principal payments which reduce the loan and increase your equity. If you look 3.5 years down the road you may be on the verge of having 20% equity. Looking at an amortization table in 3.5 years you would have a balance of about $163,000 which is just $3000 short of 20% equity on the original mortgage. However you're STILL paying the same $90 per month or $1,080 per year PMI charge. That means that you're paying 36% in PMI charges on the equity shortfall. With the 4% mortgage interest you'd be saving 40%! So just 3 years into the loan and your PMI is costing you 40% on your equity short fall. Would you voluntarily pay someone 40% interest? Thats not a good idea. It only gets worse from there. Move forward 9 months when you're about 4 years and 3 months into the loan and you now owe about $161,000 on the loan. Now you're only $1000 short of getting 80% equity. That means you're $1000 short of being rid of PMI. Yet you're still paying $90 per month on your PMI bill. This is effectively 108% interest for the PMI on that $1000 difference in equity. Plus the 4% mortgage interest charge and now at month 51 of the loan the PMI is costing you a whopping 112%! Clearly at this point it makes a LOT of sense to pay that extra $1000 towards your principal and get out from PMI charges. Like I said before... PMI can be costly. I should point out that 80% is not really a magical point that you get out of PMI. I just used 80% to illustrate the example. Getting rid of PMI is another story. You may have to get an appraisal to prove the value of the home and your home would have to maintain its value or go up in value. I'll cover more on how to get out of PMI in another post. Should You Refinance a Rental and Maybe Cash Out Equity? We own 4 rentals and we've got some good equity in some of them. Two properties we own outright with no debt. One property has a bit of debt but some equity and the other property isn't doing so well and is a bit underwater unfortunately. Overall we're certainly positive equity by a large margin. Right now we're considering refinancing a loan and maybe consolidating two loans. That would give us better cash flow and a lower interest rate. If we wanted more rental properties then we could even do a cash out refinance and use some equity as a down payment on another property. My wife and I probably aren't going to keep buying more rentals due to the extra work it takes to run them. So for us we'll likely just consolidate loans at a lower rate. There are situations where cashing out your rental property equity can by using a cash out refinance can be a good idea. Today debt is fairly cheap so taking on more debt for rental investments might be a good deal. Right now we've got very low interest rates and you can finance a rental for 4.5% to 5% range. Typically rental mortgages are a little more expensive than primary owner occupied residences which I understand is due to a bit higher default risks. But todays rates are pretty low and 4-5% is pretty reasonable interest to pay. On the other hand if debt was more expensive then I don't think I'd be signing up to pay 7% or 8% or more longer term. Todays low interest rates make refinancing particularly appealing. Generally I would only be cashing out equity on a rental if you have a very good purpose for it. You shouldn't be cashing out equity to go buy a fancy boat or so you can blow it in Vegas. I'd make sure your purpose for the cash is a good investment. Personally I think the primary good reason to cash out equity from a rental is to acquire more rental properties and increase your investment and maybe maximize the rate of return on your equity. If you have other high interest rate debts like credit card debts then rental equity might be a good way to pay off such debts. You may also want to use equity from a rental to finance some other form of investment such as starting a small business. Lets say that 10 years ago you bought a rental with a 20% down payment. You paid $100,000 for the property and put $20,000 down. You had a 30 year fixed loan with 6% interest. Your mortgage runs about $480 plus another $300 in expenses. With it renting at $1000 you're netting a cash flow of $220. Doesn't seem bad for that $20,000 down. However the property has appreciated to $125,000 and you've whittled away the principal on the mortgage down to about $65,000 so you now have about $60,000 in equity. That $60k in equity is only earning you a $2640 annual cash flow. This might be a reasonable situation to refinance and do a cash out if you had a desire to buy another rental. You could refinance that loan down to 75% LTV and then have a new $93,750 mortgage and $28,750 in cash. That cash would be enough to buy another property for around $100,000 with 25% down. Start : One property worth $125,000 and $65,000 remaining on the mortgage. $60,000 in equity netting $2640 cash flow. Step 1 : Refinance and cash out existing loan: Original property now has $93,750 loan at 4.5% and a mortgage of $475. Positive cash flow is now $225/mo or $2700/year. Thats a return of 8.6% on your equity. Plus the cash out nets you $28,750 in cash. Step 2 : Buy 2nd property for $100,000 with $25,000 down. This property will cost you $380/mo. for the mortgage and $300 in other expenses and rents for $900. Now you've got $220 /mo. cash flow on a $25,000 equity. Thats about 10.5% return on equity. So you go from one property with $60,000 in equity and $2640 cash flow giving you about 4.4% return to having two properties with about $60,000 equity and $5340 in cash flow and 8.9% total return. Sounds pretty good right? On the other hand with the original property you were only 20 years from having it paid off in full and only had to manage one unit. With the refinance and second property purchase you now need 30 more years to pay off the mortgages and it will take twice the work. And there is also the risk that your rentals could drop in value. Lets say you did the maneuver above back in 2007 right before the real estate market crumbled. If you lost 25% value in your homes they would have gone from $125,000 and $100,000 to $93k and $75k and you'd effectively have lost all your equity. But if you'd instead kept the original loan and single property your equity would still be around $28k. One train of thought on rentals is to just pay off the mortgages and then own the properties free and clear. My father did this and it worked well for him. He paid off the mortgages gradually over many years and then eventually owned all his rentals free and clear. Now he has a pretty good income stream from the properties and no debt to worry about. I think this is a fairly safe and worry free strategy. You aren't maximizing the return on your equity but you are taking low risk. I use Scottrade myself and I'm pretty happy with them. and has a nice list of the 25 steps to buying and managing rental real estate. As I've mentioned in the past we own a few rentals. Two of them are owned outright with no mortgage and the other two we have mortgages on. We bought the two rentals with cash because they were distressed fixer upper properties that were in poor condition and you'd have a harder time getting financing on. The other two rentals with mortgages used to be my wife's primary residences and she kept them as rentals as investments. Whether its better to pay all cash or to finance the rental investment depends on the situation. Theres no 'one size fits all' correct way to go. You're thinking of buying a duplex for $100,000. It rents for $500 each side for $1000 total rent. Lets assume that you have 95% occupancy, annual repairs and maintenance of $1000, property tax and insurance totaling $2000 and you pay the water and garbage for another $750. If you paid cash with $100,000 total then you'd be getting about 7.65% return on your investment. If you financed the property with 30% down and got a mortgage for the remaining $70,000 then your mortgage payment would be about $350 per month or $4200. So with a $30,000 cash investment you'd be netting $3450 which is a 11.5% return on your down payment. In this example financing the rental would be a better overall investment since it gives you higher return on your investment. Now of course if interest rates on the mortgage were significantly higher then financing would start to be a poor option. Lets run the numbers again but assume a 7% mortgage rate on the rental investment. With 7% loan your payments would be $465 a month or $5580 a year. That would give you a net of $2,070. Thats a 6.9% return on your money. The lower the interest rate, the more appealing financing can be. The higher the cash flow the easier it is to make a good return with a financed property. There are other pros and cons to paying all cash versus financing. PRO: Its much easier to accumulate cash for a down payment rather than pile up enough money to buy a property outright. CON : There is a lower margin of error for a financed property. If you have a major $5000 repair on the property one year then that could easily eat up all your cash flow. PRO : Paying all cash saves you on financing costs since you don't have to pay for closing fees on the loan. PRO : Allows you to buy some properties that won't qualify for financing. CON : Sinks all your cash into an illiquid investment. When you finance the property you are leveraging your investment. This will have a significant impact if the property appreciates. Lets say for example sake that in 10 years your property goes up from $1000,000 to $150,000 or +50%. Thats a reasonable long term appreciation rate for real estate of around 4.1% annual growth. If you pay all cash then you get a 50% return on that appreciation. Thats pretty good. However if you financed the property with 30% down then your $30,000 of initial equity now amounts to $80,000 equity. Thats a 166% return on your money which is great. If you get healthy appreciation then leveraging the property will give you a much better return on the investment. Of course we should all be aware due to the recent real estate collapse that properties do not always go up in value. Say you bought this investment back in 2006 at the height of the real estate bubble. It would not be unusual for you to be underwater on the investment at this point by 20-30%. Lets say you paid $100,000 in 2006 and today its only worth $75,000. If you paid cash you'd have lost 25%. If you financed with 30% down then you'd have lost 83%. Leverge is a two edged sword. With 100% cash purchase you're a lot safer but you miss out on the great return on investment from appreciation. When you finance you're hoping for some good appreciation and you can cash in a large return if you get it, but if things go bad you can lose all your money or worse. It has to be used before 11:59 p.m PST on June 15, 2012. I had to enter the code a couple times to get it to work right, not sure why. But if it doesn't work for you then try it again. The very first social security check was received by Ida May Fuller for $22.54 back in 1940. Today the average benefit is around $1175 a month. 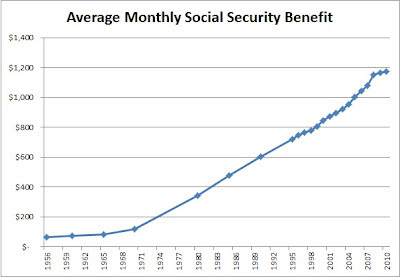 I thought it would be interesting to look at how the monthly benefits have changed over time as well as compare how much social security benefits compare to overall income levels. Here's a graphic representation of the average monthly retirement benefit for Social Security. Note this is the average for all beneficiaries and combines people getting full retirement benefit and those who took early benefits. Ok, you can see its gone up over time. But thats a long period and inflation and increased wages would cause increases in social security. 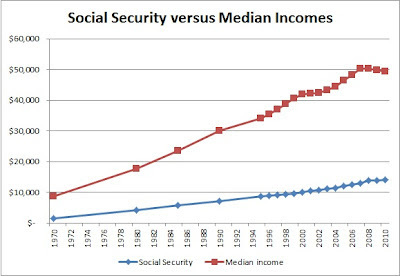 Lets look at how social security compares to the median household income over a time period. 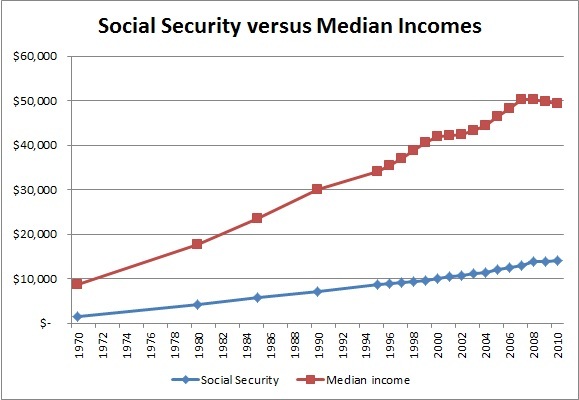 I couldn't quickly find older median income data so I'm just going to go back to the 70's for these charts. Median income has gone up at a different pace and isn't as consistent. Thats a little more due to the relationship between income and the economy in general. 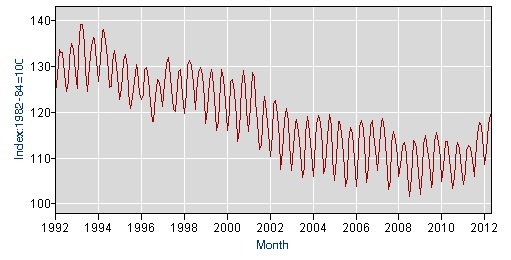 You can see it drifted around 25% for a few decades from 1980 to 2008. Then post 2008 the % increased a bit but thats mostly due to a drop in the median incomes. 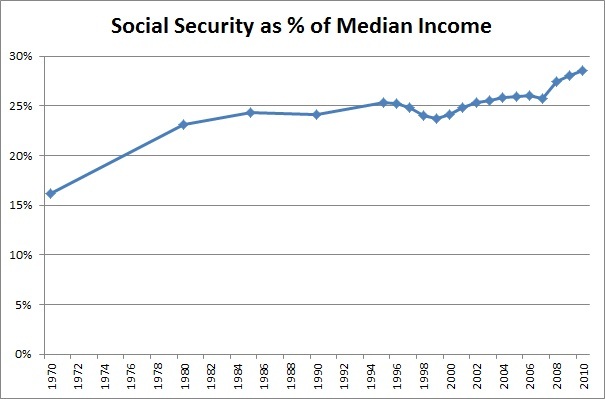 The law defining social security hasn't changed significantly since 1983. So I'm assuming the changes in the benefits since then are mostly due to changes in incomes and demographics. Yahoo featured an interesting list of the Best-Paying Jobs By Major Note the 3rd best paying job for History and Political Science both is customer service representative making under $30k. Unfortunately a lot of people have homes where they are underwater on their mortgages. Something in the range of 30% mortgage holders are underwater. This can present a large problem if you are in a situation where you need (or want) to relocate. One common solution to selling a home at a loss is to rent out the home. However renting an underwater home can also result in negative cash flow. In addition many people do not want the hassle of the extra work of being a landlord or simply aren't suited for the job. Lets say you are underwater on your home and you are going to move. How do you decide if its better to sell at a loss or to rent out the property? WE have two options. First of all is to sell now at a loss. This option is fairly easy to figure the cost due to simply counting the difference in equity. For example, lets say your house is currently worth about $100,000 and you still owe $125,000. Then you would take a loss of about $30,000 to close assuming a 5% Realtor commission. The second option is to rent out the home. This will result in a cash flow that may or may not be negative. To figure the cash flow you'd have to add up the pluses and minuses. Option 1 : Sell today and lose $30,000 out of pocket. Option 2 : Rent the house and lose $1900 per year. To me this seems like a clear cut choice. I'd much rather lose $1900 a year than give up $30,000 today. The choice is even easier if you don't have $30,000 today as most people don't. But what if you can afford the out of pocket loss today? What if the annual cash flow for renting is much higher like say $4000 a year or $6000 a year? If the cash flow loss from a rental is a significant portion of the up front out of pocket loss from selling then that might making selling a clear option. For example I'd much rather sell at a $10,000 loss today than take a $7000 annual loss by renting. Lets consider a situation where its not quite as clear whether the equity loss from selling or the cash flow loss from renting is better. 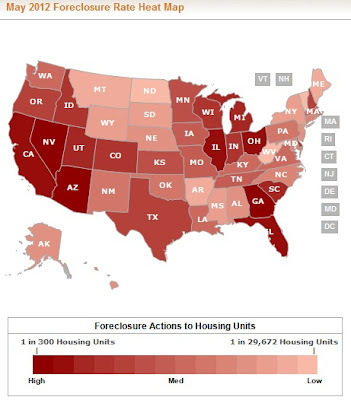 For this situation its important to figure how long till the house is hits positive equity. You don't know this for sure since you can't tell how fast housing values will change. We'll have to make an assumption about future home values. To tell what the loan balance will be in the future you would have to look at an amortization schedule. You can do that using a mortgage calculator. Lets say that housing prices gradually appreciate at 2% a year and the home is currently worth $100,000 but the loan is $125,000. You might hit positive equity in about 6 years in such a scenario. This means you could be losing about $5000 a year for 6 years until the property has gained enough value and you've paid down the mortgage such that you can sell it and break even on the sale. Rent and sell in 6 years : Annual cash flow loss of $5000 for 6 years. This appears roughly equal. However the Net Present Value (NPV) of $5000 over 6 years is lower than $30,000 today. If it would take 8,9 or 10 years till the equity is break even point then renting for that long would be a larger over all financial drain than simply selling today. Of course renting out a property requires some work. You may not be suited for being a landlord. If the financial choice is not too different between selling and renting then many people would prefer to simply not rent. Do you want to be a landlord? Would this property be a good investment property if you weren't underwater? Probably not. There are various risks with running a rental property. Your tenants may not pay rent or may damage the unit. The property may require significant repairs over time such as replacing a heating system or putting on a new roof. 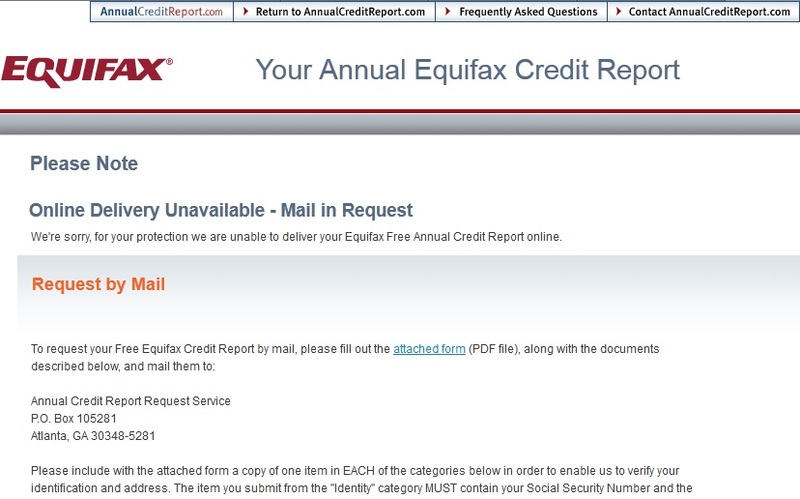 Unfortunately for some time now I haven't been able to get my free Equifax online credit report. 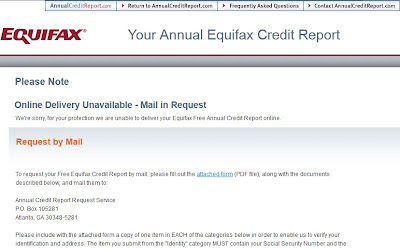 (see my older article Step by Step guide to Get Your Free Annual Credit Report for details on getting your credit reports) Every time I try to access my Equifax report from the AnnualcreditReport.com website I get a message saying its not available online. I was extra careful to double check all the security questions this time to make sure I didn't answer something incorrectly. I must be locked out for some reason. I'm guessing I probably goofed up the one of the security questions at some point and they locked me out, but thats just a theory. I should mail in the info they request to get the report but its a bit of a hassle compared to simply doing it online. There is a chance that someone else tried to meddle with my credit or log into the system using my name. But I doubt that is the case here. I haven't seen any problems in my other reports and I just got my Experian report and everything was fine there. Retireby40 wonders if he should Quit or Get Fired?